So somewhat expectedly Spotify announced their app platform. Spotify’s announcement didn’t happen in isolation though. We are moving to the next stage of the evolution of the Internet, the age of the App-enabled web. That doesn’t mean apps are replacing browsers, rather that Apps are complementing and enhancing web experiences. Sometimes this means instead of the browser, more often it means in the context of. Once software was something you bought in a box and loaded onto your PC on a disk. Now that software has been freed of the straightjacket of physical retail it is supercharging our digital lives, creating previously impossible experiences and functions. This is the context into which Spotify’s App announcement was made. 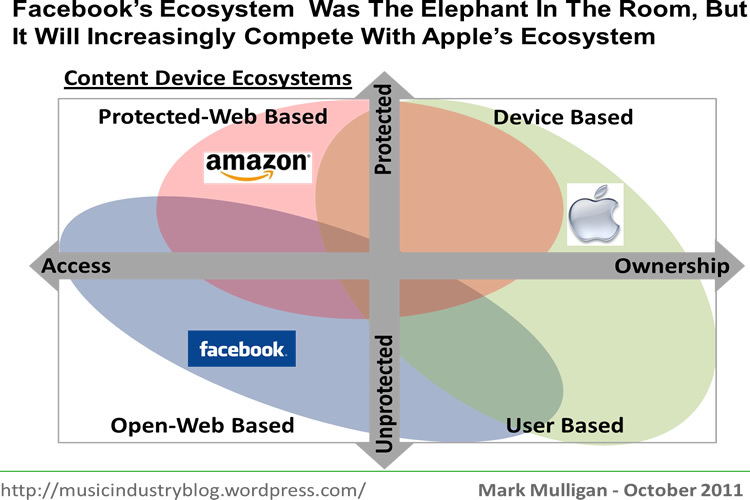 To date Apple, Android and Facebook (each in different ways) have been at the forefront of the App revolution. It is Facebook’s strategy though that has widest reaching implications. In a previous post I wrote about Facebook’s Socially Optimized Web strategy, which aims to create a device-agnostic content ecosystem which embraces our entire digital lives. This is what Spotify are plugging into via their Facebook integration and are also trying to do themselves with their app announcement. Daniel Ek is trying to implement his own version of Mark Zuckerberg’s increasingly successful platform strategy. Facebook are creating their digital content dashboard, now Spotify are creating their own music-specific one. 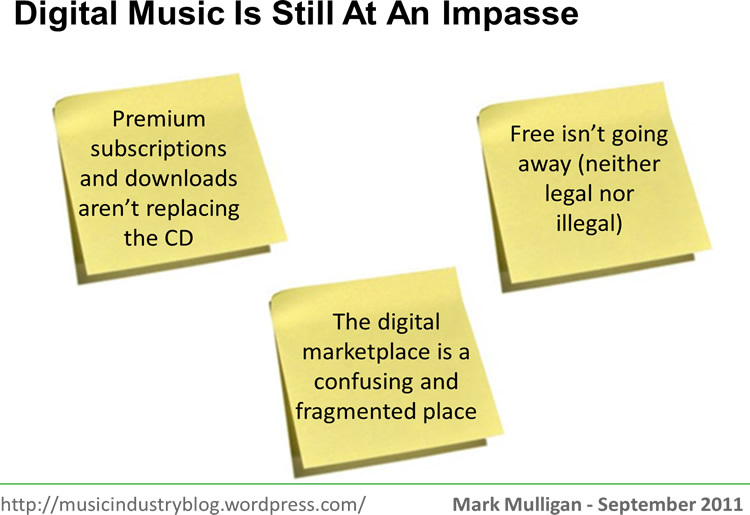 But more than just a me-too strategy, this music specific strategy is crucially important for the future of digital music. It also matters because it is part of a wider process towards the next generation of music experiences. Let me explain…. The challenges of services negotiating legal and commercial terms with rights holders are (overly) well documented. What needs to happen now is to remove that stumbling block, to make music the basic ingredient around which a new generation of services can be built. Think of launching a music service like building a house. Where we are now is that the small time builders aren’t able to afford the expensive planning process, and the big building companies are only getting the planning permission to build the same house design again and again. What needs to happen is for music licensing to move from being the ‘planning permission’ stage to becoming a ‘builders’ merchant’ where services simply go and stock up on the equipment they need to go and build their houses. 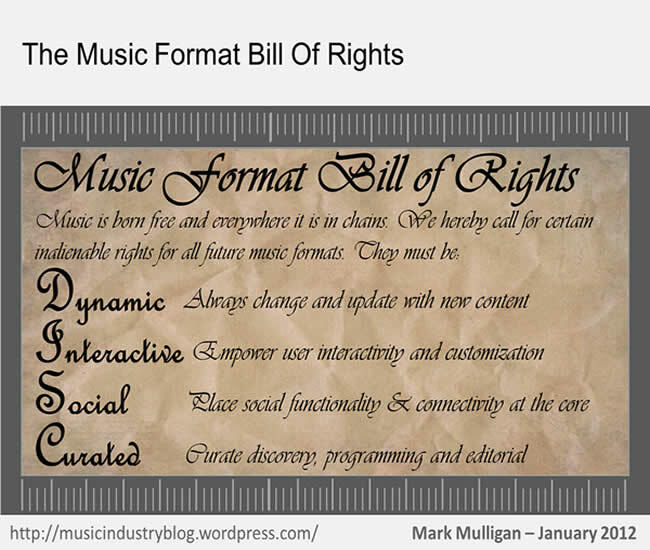 Music needs to become the API. This is where Spotify come in. Spotify is making a play for being the ubiquitous music service, the base line music access around which everything else can be built. They’re hoping establishing an ecosystem of App developers and users will help make them an indispensable part of the music industry. Of course they’re a long long way from being ubiquitous (10 million users is impressive but not exactly universal). The bigger Spotify gets, the more reach their platform will have, but the industry needs more than just Spotify to take this approach. EMI’s Open EMI announcement was a great step in this direction. Spotify takes this approach to another level. When music becomes the API, digital music will really step up to the next level. Spotify won’t be able to do all of that by themselves, but they’ve set the lead for others to follow. I recently had the opportunity to catch up Sonos’s CEO John MacFarlane, the video of our conversation is below. John is an insightful guy and hopefully this video will give you a sense of his vision.